Lucky 88 is an Aristocrat Bonus Slot which offers a random bonus feature and the choice of 2 bonuses when 3 red lanterns land scattered. Big Ben is an Aristocrat Video Slot with 5 reels and 25 pay lines. It features a wild and scatter icon, multiplier, free spin and a jackpot. Big Ben is the iconic British landmark that stands next to the houses of Parliament in London. This Video Slot contains high quality graphics, gameplay and themed features. Players may also choose between the day or night game mode they would like to play in. It also provides a range of betting options and a huge jackpot. Residents and tourists who know London will feel right at home on the reels. 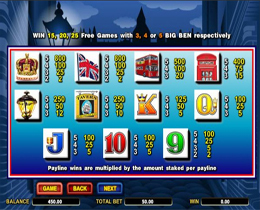 Icons depicted in this Video Slot include Big Ben, red phone booths, and double decker buses, street lamps, Queens Guards and the high valued symbols of playing cards. Players may place bets from as little as 0.01 up to $2 and you may even wager a single coin on up to 50 lines. This means that players can bet anything from 0.01 to £/€/$60, and is rather impressive considering the prizes that are involved. The guard stands proud on both the streets of London and on the reels. The guard is the wild icon and helps form winning combinations by substituting all other icons and doubling all wins. Big Ben is also another special icon as two or more in scattered positions will reward a player with a prize. Players will receive 2x, 5x, 25x or 1000x their bet when two, three, four or five of these icons show up on the reels respectively. If Big Ben shows up on the first and fifth reel, a special bonus round will be triggered and Big Ben will chime anything from 1 to 12 times. The more Big Ben chimes the higher the bonus amount will be. The most a player may win is 500x their wager. 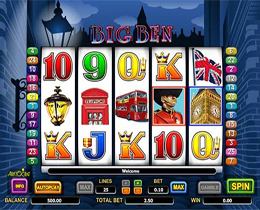 If 3, 4 or 5 Big Ben icons show up on the reels, it will award 10, 15 or 20 free spins respectively which in turn carries a 2x multiplier for any wins gained.